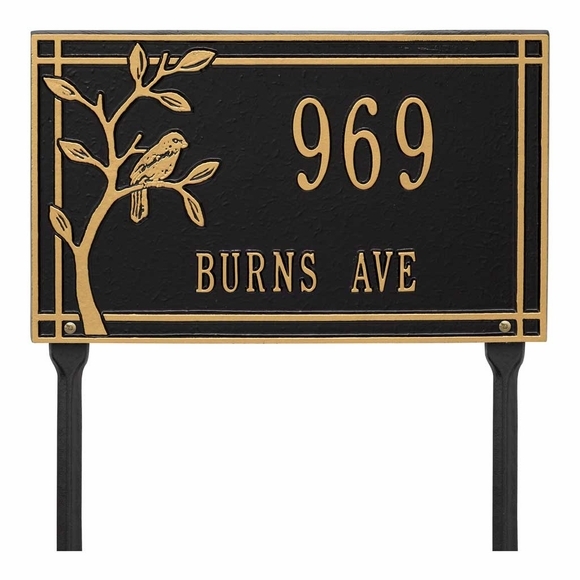 Lawn Mount Address Plaque with Street Name - - personalized address sign includes the address number and street name you supply as well as a graceful bird and branch accent to the left of the address and decorative border. Made in USA. 16" x 10.5" rectangle shape lawn sign includes two 18" lawn stakes for convenient setup. Holds two lines of personalization. To purchase the wall mount version of this sign, click top link in Related Products.